The Hotel Sandos Playacar Resort melts in with the surrounding area, remaking a typical Mexcican Hacienda; it is situated strategically very near to the archeological areas of Tuhun and Coba and the ecological aquatic parks Xcaret and Xei-Ha, which combines culture and fun in an incomparable surroundings. 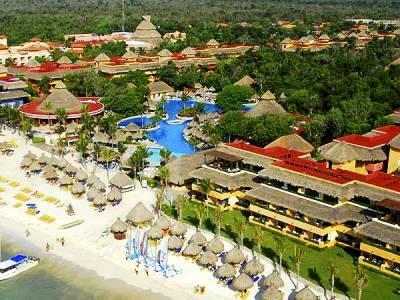 The Hotel has easy access to the beaches and has an original Mexican design with a magnificent distribution. There are activities for children to enjoy. The restaurants of the Sandos Playacar Beach Resort & Spa serve spectacular buffets with the best international dishes, there is a grill with meats prepared and served “al momento”. The Hotel is located on a marvelous beach of the Riviera Maya, not far from Playa del Carmen and the Cozumel Port. The Cancum International Airport is 45minutes away and the ecological parks Xcaret and Xei-Ha along with the archeological areas of Tuhum and Coba are all within easy reach. The restaurants of the Sandos Playacar Beach Resort & Spa serve spectacular buffets with the best international dishes, there is a grill with meats prepared and served “al momento”. Standard rooms are spacious and charmingly decorated, and have a complete bathroom and private balcony ith views of the garden or Ocean. Hacienda Junior Suites are in an area of a group of 16 buildings, each with 10 suites, there are suites available with communicating doors, ideal for families. There is a solalrium with swimming pool, creating an atmosphere of a Mexican Villa, surrounded by exuberant vegetation. Voy con cuatro familias, todas las veces que hemos ido nos las pasamos muy contentos. El hotel increíble, muy buena atención. La variedad de comida es muy buena y rica, muy atentos todos los empleados. En especial a yessi de la playa y a josue de la disco, unos genios!! Excelente es poco!!! un verdadero all inclusive. Todo perfectamente coordinado para que pases 24 hrs fabulosas. La mejor playa de la riviera maya es la del sandos. Todo muy limpio y pensado para que el huésped, de la edad que sea, lo pase genial. Estuvimos dos semanas, del 20/10/17 al 03. 11/17, y nos quedamos con ganas de más. Imposible aburrirse. No te lo pierdas. Excelente lugar para ir de vacaciones. Una atención personalizada especial. Gente muy educada. Restaurantes con comida muy buena. Mozos atentos. Juegos en la playa muy divertidos. Espectáculos de lujo en el teatro.